Lucky petrol is fixed at RM2.08. At least now I can save and plan my finances well! The diesel here oso damm cheap…nobody stopping them. Recently 300,000 litres of diesel smuggled from Kelantan into south Thailand. The diesel price in Malaysia is way cheaperer. Diesel price in Thailand is RM3.60 per litre for UF Diesel and RM4.06 per litre for UF Premium Diesel. 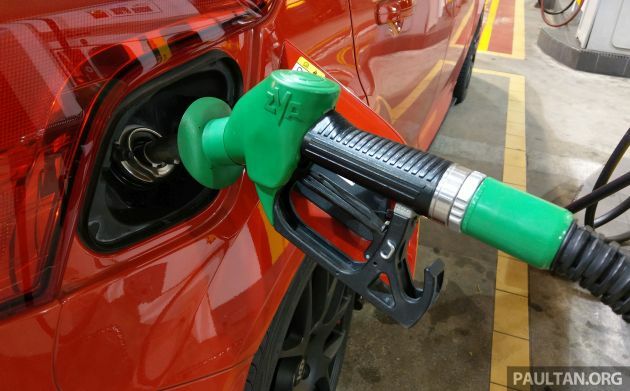 Diesel subsidi nelayan 1.65sen pakai bot nelayan dan keluar laut seolah-olah ingin menangkap ikan. Nelayan used subsidi diesel di jeti persatuan nelayan. Bossku nelayan. see who are the main people smuggling and selling diesel. Then you will know why they like to cheat our Government. Diesel subsidized by rakyat money, no less!! I have seen so many Singapore cars filling up Ron 95. This is how negligent our petrol station owners are. Our subsidy money is going to rich Singaporeans but our petrol station owners are getting richer and richer. Something needs to be done. PDAM, instead of making so much of noise about petrol price going down and asking Government to pay you compensation, what about doing the right thing and telling Singapore cars it is illegal to fill up Ron 95. Having immense amount of our oil wealth. Since oil was discovered here 60 years ago, the Government capabled to give all citizen. Free healthcare, free education, free housing, free car, free smartphone, free water, free letrik + fuel. Free Government jobs, free public transportation and tax free income. Why shud we stop at RM1.50/L petrol ? that’s why booskur jibby abolish all those subsidy and convert it to BRIM which indeed give to right people only! UP UP AND AWAY TOWARDS THE STRATOSPHERE!!!! Oh shoot, got the wrong superhero. Harga turun pentaksub membodek kerajaan. Harga dah naik, kenapa tak marah kerajaan? Dulu harga turun, skrng dah naik. Dulu harga kereta dan motor turun, skrng harga dah naik mendadak. I am so happy our petrol is fixed at RM2.08. If follow old cowboys system, I think we will be paying RM2.90 by now. Thank you for fixing petrol. We rakyat save money!!!! Me from the other side. Not gonna follow their system, paid fixed price at RM2.08. This is tantamount to price fixing cartel. At this rate, soon petrol will be at RM3.00 per liter. Where is the cheap fuel promise??? RM1:50 L fuel was never promised by PH, why you all still cannot faham? Well that’s not good enough. A plain denial is not good enough, remember? You need to show us proof that they didn’t make such promises. Since they have never shown us this proof, that means they have made all those promises. So please honour all of them right now. pls show proof and text of actual promise made for RM1.50/L petrol. Otherwise, you are just another fake news peddlar….oh wai! How about u show the evidence 1st? you guys started this nonsense. No. You guys have changed the game. Its no longer the accuser that need to show proof but the accused must show proof of their innocence. So please don’t avoid the issue. Show us proof your politicians never made those promises. It is a reasonable question that only requires a simple answer. No need to twist here and there. Please answer the question since you seem to speak on behalf for them. No such promise made. This is fake news from BN cybertroopers like john. At 2.08 it is overpriced by 58 sen. It is NOT CHEAP FOR THE REST OF US RAKYAT! Ara ara. Is Pakatan cybertrooper THAT allergic & scared of facts & truth? Why so? BN Cybertrooper, still spreading fake news. Kesian PH cybertrolls have to continue with bare faced denials of their promises. No problem, the pipu will continue to punish u all. But RM1:50 memang bukan dalam janji pun bro, why u still lying bossku? As @Hafiz Hisham said above, a plain denial is not enough. Please show proof that your ministers neve made that janji. Don’t cause more share to PH bro. MaluapaB055kurr…. Yeah, please show proof ur politicians never made those promises bossku. Just denying doesn’t make it fake, bossku. High time for our ‘yellow vesters’ to make known the intolerable levels of promises broken. Viva le Malaisie! World prices going higher means Malaysian Petronas makes more money. Past 10 years, some years, Petronas made RM100 billion per year. My Aruz finally came and I can assure people, once you drive the Aruz, you don’t have to worry about fuel cost. The car just sips petrol gradually and the tank just last forever!! Thank you Perodua for giving me such an economical car yet with a continental feel! Hahaha.. my honda city hybrid are more fuel saving and efficient than your aruz.. don’t be ridiculus lah..
And cheap RM4 bus service to KLIA or KLIA2. Very happy because fresh grads have less reasons to pay off their PTPTN loans, is that it? Our future is rapidly heading down the sewers with such mentality. RON 95 seliter RM2.08 , masih murah berbanding Brunei. Syukur nikmat Malaysia kita. Capati again. Sigh…. we need another by-election, FAST! The longer they play dumb about the promises they made to win votes, the longer they will remain arrogant and think the rakyat are fools, are puppets to be toyed by them. Yes. I’m also waiting. Pakatan when? Telur turun 2 sen.. Kenapa tak puji kerajaan? Minyak naik dipersalah kerajaan.. So fed up with john and his crap here. OMG, now i gonna sell my mazda 6.. I hope our regular troll here does not come here with his 50 different dupes asking RM1.50/L petrol MANA? Our highly esteemed PM, Tun Mahathir already said this is FAKE news and it was NEVER promised in PH manifesto. I rather believe a highly regarded PM, a highly educated doctor, our beloved PM for the past 30 years than a keyboard warrior with 50 dupes frustrated he has not got his dedak since May 9th 2018. So here is another PH trooper I found using multiple names. Anyone is free to copy my posting. Just like your local university students who like to plagarise. Nothing wrong with it right? words look different despite same essence. This is fine. Does not mean it is the same person if another subscribes to his views and thoughts. The more and more you post in these forums, the more and more i 100% believe you are here to troll and cause flame wars just to see what people will react to your nonsense. If it’s not crazy and nonsensical theories on Proton with Geely and deciding to disregard facts towards it, it’s now the same thing with your political nonsense. I mean really? …Do you live under a rock? Do you shield your eyes of all facts? Do you see what’s right in front of you and decide to say “I don’t see it”? I really can’t fathom mentalities such as yours, you can see what is happening right there in front of you and you literally just turn around and say you don’t see it? Or do you just inside a hole deep enough that none of it you can physically see and you think just by constantly & repeatedly deny all those factual news and videos of PH politicians making all those fantastical promises, were fake news and never happened? OMG OMG OMG OMG OMG OMG! U caught him nice and gud! Lolz!